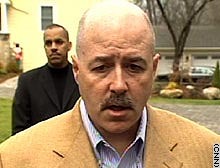 Bernard Kerik has headed the NYPD and trained police officers in Iraq. Bernard Kerik explains his decision. NEW YORK (CNN) -- Former New York Police Commissioner Bernard Kerik said Saturday that withdrawing his name from consideration for Homeland Security secretary "was the right thing to do." Kerik said while he was putting together documents for the background investigation that would have been part of the confirmation process, he found that a person he employed as a nanny and housekeeper had questionable immigration status. "Late Wednesday evening, I became aware of what I thought may be a problem in some tax filings on a housekeeper, a nanny, that I had working for us in my home, with my children," Kerik said. "Over the next, I guess, 48 hours or so, I came to realize that in addition to some of the tax issues that I thought I may have, there may have been a question with regard to her legal status in this country." He said he called President Bush on Friday night to request that his name be withdrawn, "based on my findings and based on precedent." The immigration status of household help employed by prospective high-level government officials has been an issue in the past decade, beginning in 1993 when former President Bill Clinton's first pick for attorney general, Zoe Baird, was forced to withdraw after admitting she employed two undocumented workers and did not pay required employee taxes for them. His second nominee for the same post, Kimba Wood, also withdrew when similar nanny problems came to light. Bush's first nominee for Labor secretary in 2001, Linda Chavez, also withdrew her nomination after disclosing that an illegal immigrant had lived in her house in the 1990s and performed household chores. A White House official told CNN the White House employs a "thorough vetting process for nominees and we remain confident about its effectiveness." "As Mr. Kerik admitted himself, he should have brought this to our attention sooner. The president respects his decision and wishes Commissioner Kerik and his wife well," the official added. "The White House, the president, was extremely supportive," Kerik said. "They understood my decision, accepted my decision ... I didn't want this to be a distraction going forward to the president, to this country. I think the Department of Homeland Security and this position is probably one of the most important in this nation. "This is my responsibility. It was my mistake," he said. "It wasn't a mistake made by the White House. I think during their vetting process, this was something they had looked at, but in a deeper, closer look by me, it was something that I felt I couldn't move forward on. "It was a stupid mistake, and I'm in the process of rectifying it," he said. In Kerik's letter of resignation to President Bush, he said that though serving in the Cabinet post would have been "the honor of a lifetime, I am convinced that, for personal reasons, moving forward would not be in the best interests of your administration, the Department of Homeland Security or the American people. As part of the confirmation process, Kerik planned to sever his ties with Taser International and Giuliani Partners, the firm headed by former New York City Mayor Rudy Giuliani, where Kerik was a senior executive, a White House spokesman said. The two men became internationally acclaimed after leading the city through the aftermath of the terrorist attacks of September 11, 2001. Giuliani expressed disappointment Saturday that Kerik had to withdraw, but voiced confidence in him nonetheless. "I understand. I agree with his decision that he had to drop out," Giuliani said. "I believe the issue is a dis-positive one for someone who wants to run an agency that has the immigration service as part of their function. "It would have been a very bitter, difficult battle which probably would have resulted in his not being confirmed, if history is a guide," Giuliani added. "That would have been a very unfortunate thing to do to a critically important department and to a president who deserves nominees who can be confirmed easily," he said. "The irony of this is, he's about as qualified as he could possibly be for this job." Sen. Hillary Rodham Clinton of New York also lauded the expertise Kerik would have brought the job. "Bernard Kerik would have brought to the Department of Homeland Security his firsthand knowledge of combating terrorism in New York," Clinton said. Kerik's withdrawal leaves Bush looking once again for a leader for the 180,000-employee department that was created by combining 22 previously separate federal agencies. The department was charged with developing and coordinating a national strategy to protect against terrorist threats. It also oversees border security and immigration, responds to natural disasters and screens airline passengers. Tom Ridge, the department's first secretary, announced his resignation November 30, though he has agreed to remain until a successor is confirmed by the Senate. In 2003, Kerik went to Iraq at Bush's request to help train the new Iraqi police force and also campaigned for Bush's re-election, making a speech at the Republican National Convention in August.